Too few patients and family caregivers are aware that palliative care can and should be offered to all people living with serious illnesses including kidney disease, from the time of diagnosis and regardless of age or stage of disease progression. Palliative care could be right for you if you are living with chronic kidney disease (CKD). Palliative care is a specialized type of medical care that can help people living with CKD by alleviating pain, other symptoms and stress at the same time they are receiving treatment to cure their disease. Board-certified palliative care specialists partner with you, your family, your nephrologist (kidney doctor) and other professionals to provide comprehensive medical care focusing on pain and symptom management. If you have CKD, you already know that you need to take special care of your body. Managing care and treatment for kidney disease can be a round-the-clock effort that can put enormous physical and emotional strain on both the patient and the family. Here are several ways that palliative care can offer people with CKD an extra layer of support. Palliative care is provided alongside curative treatment. Your palliative care team will work with you to provide relief from conditions related to kidney disease, including high blood pressure, heart disease, diabetes, and kidney failure. Palliative care is a team approach to care. Palliative care can help you make critical decisions about treatment options including dialysis and kidney transplant. Your palliative care team can help you understand and decide whether to go on dialysis. If you are already being treated with dialysis and your health is declining, palliative care specialists can help you transition to managing your disease without it. Patients eligible for a kidney transplant often turn to palliative care before, during and after their surgery. Whatever your treatment options, the palliative care team will work side-by-side with your nephrologist and/or transplant team to support you. Your palliative care team will spend as much time as you need to help you and your family members better understand your condition and treatments and better communicate among yourselves and with others. The burden of CKD and kidney failure can be heavy – in addition to related symptoms and difficult decisions regarding your care, you may have emotional, spiritual and practical concerns. Palliative care provides emotional support for both patients and their families. Your palliative care team can often provide additional therapies, including massages, talk therapy, and relaxation techniques, to ease emotional and spiritual stress. How does one find out more about getting palliative care? You can speak with your doctor. 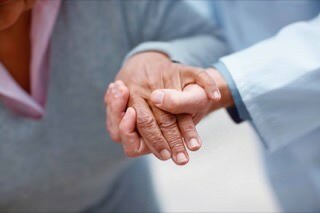 For more information on palliative care, please visit GetPalliativeCare.org. Information about hospitals by state that offer these services can be found on CAPC’s Palliative Care Provider Directory.